It’s the season to be cheerful. Part-exchanges are now coming through thick and fast and the dealer chains need their money back. 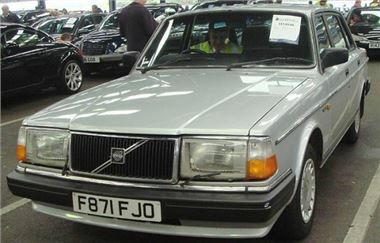 Today, this decent enough old lump of a Volvo: 88F and showing 185k miles started at £20 and sold for £200. A bashed about 95N Astra diesel estate was ridiculously cheap at £110. While even reasonably insurable stuff, like a decent to drive 60k mile 97R Fiesta 1.4 16v went for £975. A new-shape Focus 1.6LX auto was cheap too, at £5,900. And an o6 Corolla Verso 2.2 D-4D at £9,500. But not everything was. People are now coming down to the auctions in droves in search of a bargain and some of them are getting themselves into private bidding wars, even it it’s just against the wastepaper bin. A 99k mile 98S Honda Civic 1.4 30door may have a good reputation, but it was reserved at £700 so £1,125 really was TFD. So was £800 for a 52k mile 98R Hyundai Atoz auto that looked like wardrobe on castors and doesn’t have the same reputation. Prime Fleet, Leaseplan Live Online, Black Horse, Lex, Bank of Scotland, Renault Financial Services, General Section, Jardine p/x, Inchcape p/x, Sytner p/x, Snows Group p/x, Trident Honda p/x. Light Commercials from Lloyds TSB, Dagenham Motors, Royal Mail, Lex, Vauxhall Leasing, Fleet Direct, Northgate, Peugeot. Fleet & Finance, LTSB Autolease, Lex, Bank of Scotland, Motability, General Section, Masterlease, Hitachi Capital, Peugeot Motor Co., Inchcape p/x, Charters p/x, Private Sure Sell. Fleet Direct, Lex, Bank of Scotland, Inchcape Prestige, Porsche p/x, Mercedes Benz Retail p/x, TOP CAR, Franchised Dealer p/x, Inchcape no reserve p/x, Hartwells p/x, Pendragon p/x, Ridgeway p/x. Prime Fleet, Hitachi Finance, Leaseplan Live On line, Black Horse, Lex, Bank of Scotland, General Section, Jardine p/x, Inchcape p/x, Renault Financial Services, Sytner p/x, Snows Group p/x. Light Commercials from XBG, Leaseplan, Citroen, Fleet Direct, Northgate. Fleet & Finance, LTSB Autolease, Motability, Lex, Bank of Scotland, Vauxhall Leasing, Masterlease, General Section, Hitachi Capital, Inchcape p/x, Charters p/x, Private Sure Sell. Fleet Direct, Lex, Bank of Scotland, Inchcape Prestige p/x, Porsche Retail p/x, Mercedes Benz Retail p/x, Franchised Dealer p/x, Inchcape no reserve p/x, Hartwells p/x, Pendragon p/x. Volvo Car UK, Leaseplan Live Online, Black Horse, Lex, Bank of Scotland, Prime Fleet, Jardine p/x, Inchcape p/x, Sytner p/x, Snows Group p/x, Trident Honda p/x. Light Commercials from Lloyds TSB, Dagenham Motors, Royal Mail, Lex, Vauxhall Leasing, Fleet Direct, Northgate, Peugeot, and Non Runners. Fleet & Finance, LTSB Autolease, Lex, Motability, Bank of Scotland, Citroen UK Ltd., Masterlease, Hitachi Capital, Peugeot Motor Co., General Section, Inchcape p/x, Charters p/x, Private Sure Sell.